In the previous article we talked about the innovative Italmodular protecting counters PROTECT LINE®. Today we present you our line of commercial metal shelves. The modular shelving and trolleys making up the IM 92 system are the ideal solution for anyone needing to organize, handle, display and make the most of available storage space in compliance with hygiene standards. The IM 92 system lends itself to a host of different applications, ranging from catering to the hotel industry, from walk-in refrigerators to the whole food industry, from the pharmaceutical trade to storehouses in general. Furthermore we offer products lasting stability against corrosion by water and moisture and provide a high standard of hygiene. The elegant design and extensive choice of standard sizes make the shelving highly adaptable, allowing for a great many combinations. This new shelving model is the optimal solution for organizing and increasing available storage space. Its innovative overhead sliding system makes it the ideal choice for increasing storage surface area by between 25% and 90% compared to traditional shelving. 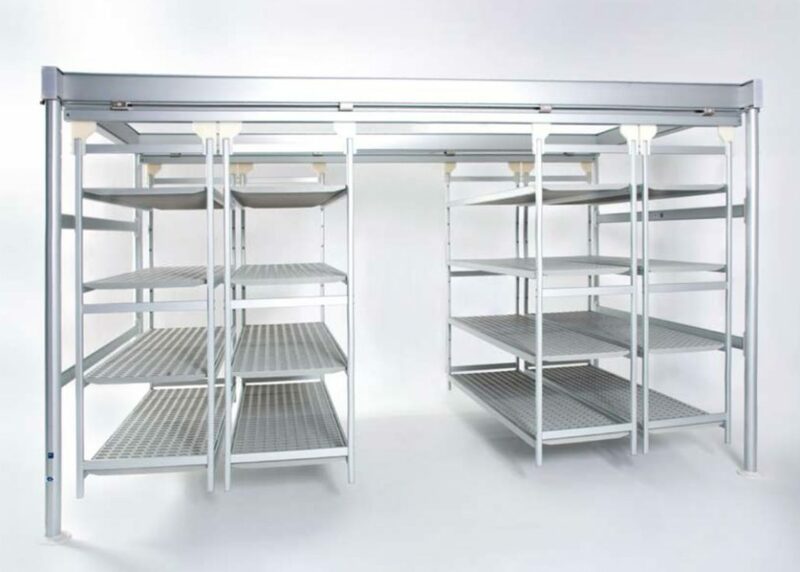 Made from anodized aluminium alloy with polyethylene or aluminium shelves, this shelving version rewards you with greater savings in terms of cost for installing cooling and air-conditioning systems; and, because it is hung off the floor, the whole floor is easier and quicker to clean, thus resulting in a more hygienic space. With its great versatility, the system increases and organizes space in many areas of application. At the same time the extensive choice of standard sizes makes the commercial shelving highly adaptable, allowing for a great many combinations and resulting in considerable space saving. EASY COMPACT is the ideal solution when you want to organize, increase and exploit your available space. This adjustable metal shelving is perfect especially for mid-to-small-sized rooms, with light loads – with a more affordable investment. With its highly modular nature and two side shelving units acting as supports, this system allows you to add other fixed shelving modules and thus create numerous compositions. The two central modules are lifted entirely off the floor. This makes EASY COMPACT easier to clean underneath and thus assuring high standards of hygiene. 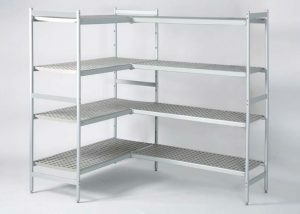 In our offer of metal shelves there is also the FLOOR SLIDING SHELVING. With its versatility, the system increases and organizes space in many areas of application. Furthermore the extensive choice of standard sizes makes these adjustable shelving units highly adaptable, allowing for a great many combinations and resulting in considerable space saving. Each sliding module has a load capacity of 400 kg. Both stable and sturdy, they do not need any special fastening or anchoring. The smooth, rounded surfaces, the closed profiles, the total absence of gaps and cracks in which dirt can lurk, making the job of cleaning the space easier and quicker, combine to deliver a high standard of hygiene. Lasting stability against corrosion by water and moisture is another feature of this product. 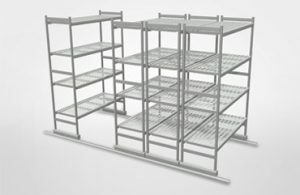 The great versatility of this aluminum shelving system allows you to organize and optimize space in any room. It is made from anodized aluminium alloy with aluminium or polyethylene shelves or AISI 304 stainless steel. This guarantees lasting stability against corrosion by water and moisture and provides a high standard of hygiene. Moreover the quality of the IM 92 modular shelving is guaranteed by the international marks NF and NSF. Thanks to “Shelving Optimization”, an easy-to-use software that Italmodular issue to their dealers, it takes just a few minutes to choose the furnishing solution that best suits. The software gives you a 3D view of the solution along with the relevant estimate. 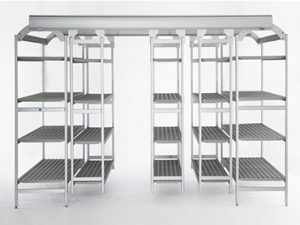 Furthermore the absence of gaps and cracks makes MODULAR SHELVING easy to clean, ensuring an high standard of hygiene. For further information you can send us a message and we will take care of your request.